We are at the forefront with hospitals' national movement to standardize color coded hospital wristbands. Our goal is to help hospitals prevent potentially dangerous mistakes, such as giving the wrong food to an allergic child or allowing a patient with balance problems to walk unescorted down a freshly waxed hallway. The nation's leading hospital accreditation agency, known as the Joint Commission, has expressed caution about the new system, citing concerns about branding patients by their end-of-life choices or inadvertently broadcasting those choices to family and friends who have not been consulted. Hospitals are needing to strike a balance between the need for patient safety and accuracy and the whole privacy concern. EasyID are proponents of the color coded wristbands and agree that standardized colors are essential to patient safety. EasyID offers a large selection of Alert wristbands our products are an integral part of the most successful patient safety initiatives at today’s top hospitals. 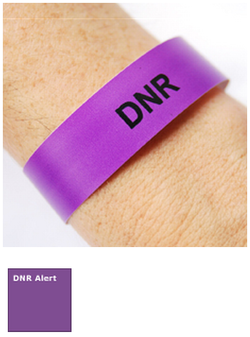 For more information about Alert Wrist bands and their applications in the healthcare industry, contact our patient Identification specialists.